Sam Buck Rosen is a musician and new painter from Newburyport, MA currently living in Los Angeles. The paintings in this series were begun in Northampton, MA, while living at the former Methodist campground Laurel Park. The unique houses there, now converted for year round use, in addition to some more recent works of houses in Newburyport, are the subjects of these mostly nocturnal paintings. 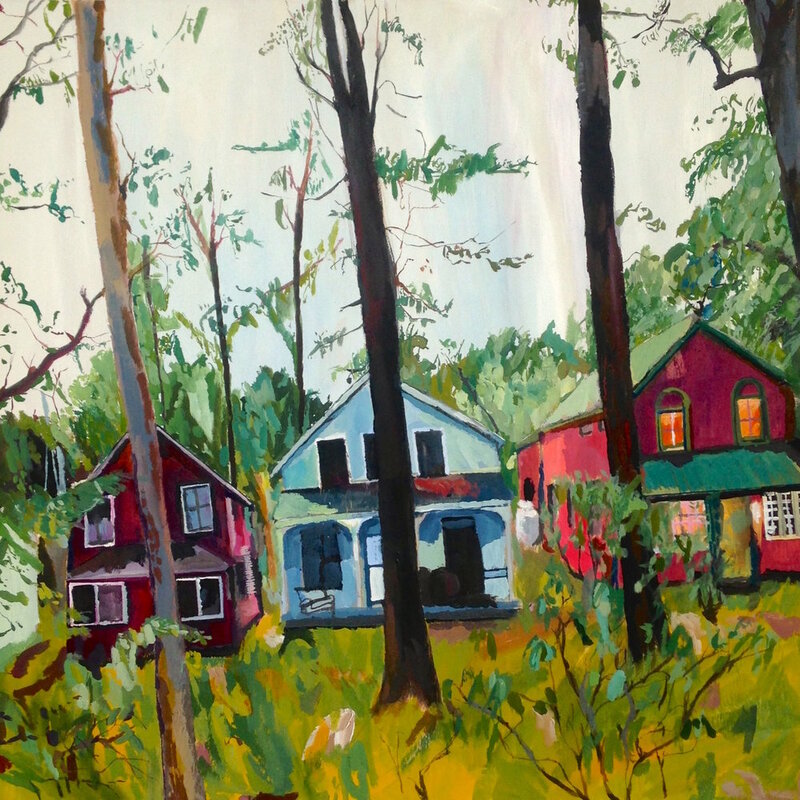 "I was inspired to do small works of houses late last year, when I was lucky enough to stumble upon the paintings of three women; one a household name, one a complete unknown and lastly the very early works of a painter still practicing. My grandmother's partner used to do taxes for renowned folk artist Grandma Moses and was once gifted one of her magical paintings. Last Christmas, I held this tiny canvas in my hands and admired it's color and simplicity. However, I wasn't motivated to try my own hand until I inherited with my boyfriend a trove of paintings done by his aunt and grandmother, Karen Rovner and Nessie Goodman respectively. I've admired Karen's work for a long time, but we are lucky enough to have some of her first paintings now, a pink sponge on pink tile (which for the longest time I thought was cake), a dark man in profile, her work was then as it is now, worth seeking out. Nessie Goodman is 91 years old now. She always said, in reference to the "NG" signature on her paintings "N.G. stands for No Good." I'm honored to have a few of her small, muted landscapes. To call these "no good" is so wrong it's criminal. As soon as we had these hanging in our house in Laurel Park, I started painting if only to try and mimic her effortless, slightly abstract genius. Of course, one crucial inspiration I've omitted thus far is my mother Paula Estey. Her shape shifting artistry has always encouraged me to seek out new forms of expression and we push each other to keep going when it seems the well has run dry. Thank you for giving me to opportunity to share the space with Tobin Eckian and Lisa Goren, I am truly honored."